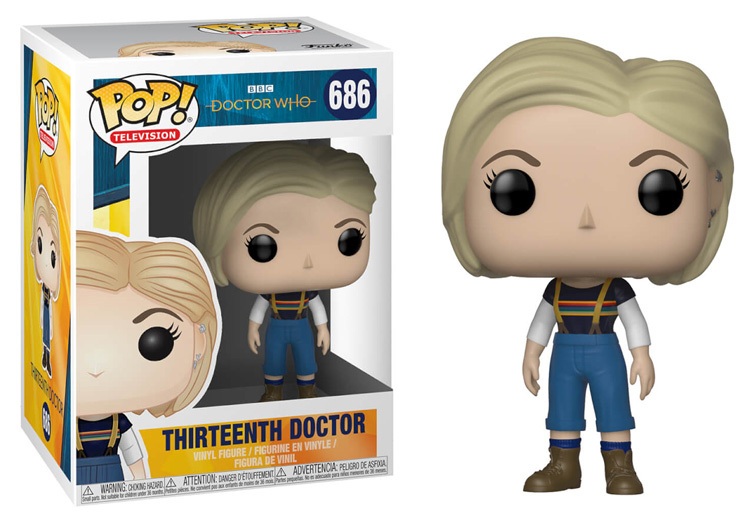 This 13th Doctor without Coat Funko POP! Vinyl figure joins the Doctor Who range. The 13th Doctor without Coat is a new addition to the ever growing Funko POP! Vinyl range. Each character stands at around 9cm tall and comes packed in an illustrated window box. Collect them all now! Contacted funko about the sdcc version looks like this is all were getting……..
“Thanks for getting in touch. This particular Funko Pop! has been Vaulted which means it will no longer be in production in the foreseeable future. This was an event exclusive item and it doesn’t look to have been released at retail. best thing now would be for them to get and coated with removable scarf version out. we need some more classic ones!! just received this from amazon, they sent it in a bag so its completely squashed, what stupidity. Amazon over the past year or so seem to have gone downhill both with their packaging & delivery. Items mangled or damaged already, sent out in perfect boxes which then only have to be returned. Again, items badly damaged because of rubbish packing; again ending up being returned. Items being delivered to a totally different address, thrown on your doorstep, chucked over your fence or dumped in a rubbish bin. I’m hoping mine comes in a box because I ordered something else with it. Nice one Mick! Got this and the holiday special Spiderman pop. Always get 2 at a time to get free delivery. Wow. They supply the UK with 44 of the SDCC variant, DESPITE stating that it would be available at a later date. Then they supply us with so few of this one that it’s out of stock within twelve hours of being officially announced. I’m done with them now. They clearly don’t want my money and I’m not investing anything else just to end up with half a collection. When their own stockists constantly tell you how bad they are as a supplier you know it’s bad and the fact that they’ve done nothing to sort this out; in fact it’s getting worse; is incredibly poor and shows a huge lack of respect for the customer base they have here in the UK. Sadly, I have to agree with you. It’s also not just Funko either. I have stopped collecting many line’s of Dr Who Merchandise precisely because I can’t get many of the actual items. Case in point being Titan Figures that I gave up on about 2 sets back. If you can’t get a complete set why bother with it? Is there a variant with a coat or is this the only version ? Was this out of stock at the same time of them putting it up or did it literally sell out that fast?